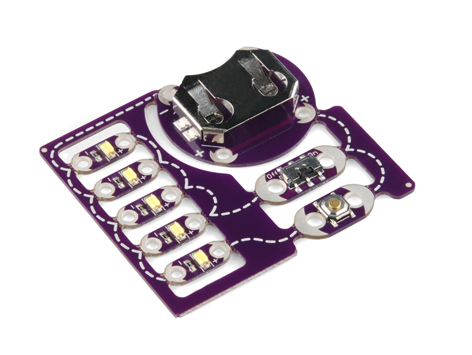 Take prototyping to the next level with the ProtoSnap! One of our most important goals at SparkFun is to introduce beginners to electronics. We really do want to "share ingenuity" - and that means with electrical engineers, students, prototypers, inventors, or just anyone who is interested. We want to make it easy and not intimidating to get started in electronics. 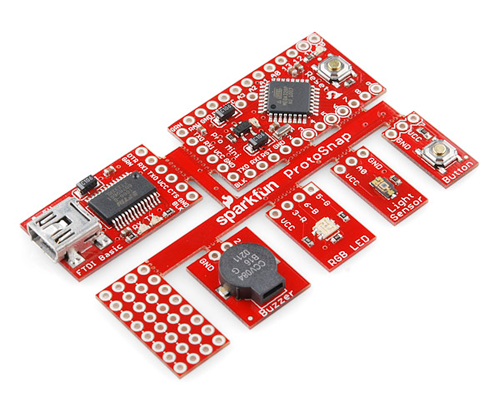 Which is why we are announcing the latest SparkFun line of products - ProtoSnap! ProtoSnap is developed with the beginner in mind. Each ProtoSnap device comes shipped pre-wired and ready to use - all you have to do is program them. There is no need to worry about breadboards, perfboards, wires, or soldering. When you get used to the programming style of Arduino, break the pieces apart and use them individually in any project you want. The ProtoSnap ProMini connects our Arduino Pro Mini to an FTDI Basic Breakout, which is used to program the Arduino. Situated next to those boards are a range of inputs and outputs, including an RGB LED, light sensor, buzzer and push-button. There's even a little prototyping board, should you need to add another component! Read this tutorial for some more info. The LilyPad Development Platform is centered around our LilyPad Arduino Simple. Surrounding that main board are a large assortment of LilyPad boards -- LilyPad Vibe Board, LilyPad Tri-Color LED, LilyPad Button Board, LilyPad Slide Switch, 5 LilyPad White LEDs, LilyPad Buzzer, LilyPad Light Sensor, and a LilyPad Temperature Sensor -- all of which are wired up to the Arduino. 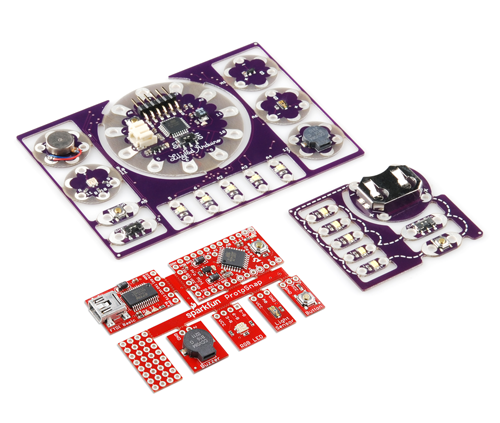 The Development Platform also includes a LilyPad FTDI Basic Breakout Board to program the Arduino. Check out this page for more information! The LilyPad E-Sewing Kit wires up our LilyPad Coin Cell Battery Holder to a Slide Switch and Button Board, which are in turn connected to five LilyPad White LEDs. Lacking any microprocessor, this ProtoSnap is aimed more at teach simple circuits than programming. Check out the tutorial! Give the above video a look for some info about the ProtoSnap line! We are really excited about these new products and hope you find them useful. The regular product post will be go live tomorrow, Saturday July 30th. Cheers! I understand the hesitation from anyone already capable of taking a project from design to completion, but you are overlooking an entire population of people that are a bit overwhelmed and/or intimidated by electronics. The ProtoSnap line is not intended to support laziness or 'cheating,' it's intended to lower the barriers for people. We had numerous people thank us at EYEO for giving them the opportunity to finally get their feet wet with physical computing, Arduino, and electronics. Please do not underestimate the value of products like these for education and sparking (excuse the pun) interest in people - especially children! Hear hear! I'm something of an evangelist on the subject of getting people over the hurdles of initial entry into embedded computing and robotics, so I talk to a LOT of people about it. Obviously, this product isn't the do all end all, but it's a great tool to allow the beginner to focus only on the programming (Which in my opinion, is the hardest skill to break into of the embedded computing / robotics skill sets.) without having to endlessly "check the wiring" when a sketch doesn't work right. I think all of you guys who are complaining about LAZY need to write your code in HEX or Binary and build your circuits out of discrete components (I mean Rs, Cs & Transistors). No Assembler or Compiler and by no means NO Integrated Circuits of any kind, that would just be too LAZY. Just look at this as yet another layer of abstraction. It lets you concentrate on the objective without distraction. Writing code on the computer is too lazy. You need to manually bit bang the ICSP interface using DIP switches. pr punch cards there you go dont want to be lazy hand write your code then transfer it to punch cards. Punch cards? Don't be lazy, manually toggle the data input switches in real-time! About a month ago, we held a workshop at eyeo Festival, and debuted a prototype version of the ProtoSnap ProMini. In the past, teaching people about microcontrollers or Arduinos required at least several hours getting inputs and outputs just physically connected. Our experience at eyeo was quite different. People might still have a small barrier with getting the Arduino software and proper driver installed on their computers, but other than that, we were allowed to almost immediately concentrate on helping people get the inputs and outputs to act in the way that they wanted. To say it another way, using the ProtoSnap separates the programming of a microcontroller from the mechanics of connecting things (whether through soldering or breadboards), until the point that you WANT to get into those mechanics. At that point, just snap it apart! There are software people and there are hardware people. Hardware people have no problem wiring things up and getting going. However, software people have a bit more of a barrier. I used to be a software person, and through Arduino became a hardware person. Now I am more annoyed by the software side of things as opposed to the hardware side. This seems to me like it's a product meant to draw in people who know software but not hardware, and want to learn. Breaking down barriers is what it's all about! Oh, come on. How much do you actually learn by laboriously soldering wire after wire to perfboard? My father -- a tech trained in the 1940s -- used to say the same sort of thing. He never really trusted transistors, and was flummoxed by op amps. He seemed to think it was cheating to grab an amp instead of designing it from scratch. Now it can be great thing to design something from scratch --- if that's what you want to do. But having to do everything from scratch means your learning curve is enormous and your success rate is low. That is a completely different scenario. Opamps can be implemented in a design, while these boards cannot, as they are designed to be learning tools. There are many different types of learners. These boards may be helpful to one type, but not another. My point is not so much about the op amp than concept of building blocks, and the idea that using them is somehow wrong. I picked on IC op amps because now everyone sees them as fundamental blocks. When they first came out, people didn't trust them. They just weren't right. I had a prof who claimed you shouldn't really use an IC you knew how to design it. Fortunately, I had other profs with more enlightened views. If all you're going to do is a "paint by numbers" circuit --- of any kind --- you're probably not going to learn much. But if someone clears the obstacles out of your way and lets you get on with concepts instead of minutiae, you're going have a chance to expand your abilities. Naturally, no one system will be suitable for all learners. So I think it's great to have more tools in on the shelf. Anything that keeps a student from getting bogged down and frustrated is a good thing in my book. To further continue the "paint by numbers" analogy, I'd bet that there would be a lot less painters if they all had to mix their ingredients to make their paint, build their canvas out of cloth, build the wooden frame for the canvas, build their paintbrushes from scratch, etc. Building all the materials doesn't make you a better artist. Those break-apart boards are pure genius: it's like training wheels to help you get started with electronics. And just like training wheels, you can remove them once you feel safe enough. It has the side-effect of lowering the cost barrier of entry since you can re-use the snap-apart parts in your projects. That really isn't how it works. Of the number of people you expose to the skill sets of embedded computing / robotics, you will retain only a small percentage. You need all the advantages you can get. Electronics, I.E. the skill of combining components into a useful circuit, is only one skill of many. That skill MAY not be the ballywick of the prospective student. Likewise, others may not take to programming or mechanics, but may respond well to the bare components and breadboard approach you mention. The value of this product is that it focuses on ONE aspect, and allows the focused development of that one aspect (Programming). There are (As I see it) 5 essential skills in embedded computing / robotics. Mechanics, Electronics, Programming, Manufacturing, and Critical Problem Solving. People can focus on one, and be part of a larger team, or be a Jack of All trades and be more solo. But you can't do any of that if you get weeded out by being forced to do the "hard" skill first. If I might make a suggestion, packaged kits (a sturdy, space-efficient box, laminated info cards and so on) would sell well for the educational market. It's a great way to present hardware. It's not just for hardware beginners, it allows for a software & hardware beginner to learn how microcontroler programming works, with this if something isn't working, you know that it must be a code problem. Anyway, if you are working with electronics, seriously, sooner or later you will face the soldering issue, but with this you can first learn the software side and postpone the hardware problem. This can be a great relief if you don't know nothing about software and hardware. It is like working with a development kit, but you can take apart at the end and use it for a practical purpose. But I Think you miss the point, you only need to snap them apart and solder them them something else AFTER you have become familiar with using them. Again these aren't for seasoned vets, their for beginners and otherwise non-hardware type people. Me, I have been an AS/400 programmer for the last 20+ odd years, haven't had to program anything 'real' in C/C++ since school. Never trained in electronics. Now that I am older and the kids are gone (mostly! ), I have more time on my hands and decided to pick up a hobby I always wanted to invest in but didn't really have the time. NO, I don't want to start at the beginning. I want to be creative quickly, something along the lines of instant gratification and such. Yes, you may say I am lazy, I beg to differ though. Yes I blinked an LED into eternity, but now I understand the difference between PWM and PPM. I also have learned how to get a 'bare metal app' to run on a ARM processor. Eventually I may need to go from the bottom up, but for now I don't need to. and thats the key point, 'I DON'T NEED TOO'!!! If I was still chasing a career or making money or blah blah blah, then yes you're right. But for some of us this is about a hobby, and doing something that we consider 'fun/interesting/whatever'. and sometimes simple/easy/lazy is better/easier/faster. No need to fret about people using Arduinos to blink LED's! Overkill is fine if peoples' projects and understanding are moving forward; it's not your money they're spending on their boards. Oh, that is hella clever! Throw in a sample code set that contains a good (but simple) explanation of C that carefully explains everything that's going on in the short examples, and you have an awesome beginner trainer! I don't think the fab houses would have much of a problem. the tabs between the boards is commonplace in PCB design, as far as I understand. The company I work for uses them for everything, barely ever touching v-score. Yeah, it took a couple prototypes to get it right, but eventually they understood what was going on with the tricky dimension layers. We rarely have mill layers in our designs too, so this was something special for sure. For most of our products in production, we've actually moved away from "mouse bites" (as we call them). All of our panels come with v-scores to separate the panels. Although V-scores are definitely easier to break apart, they don't allow for a trace to route in between the mouse bites. Mouse bites are not the cleanest break, but with a little sand paper you can clean them up without too much effort. Hope you enjoy them, and we're all excited to see all the newbies creating fresh projects! Thanks for the details, this is really innovative kit product package and it's cool to hear about the development process. Would it be possible to use an extra layer and some vias. Ive seen V-score on 8 layer boards which ends up leaving the 4 middle layers in tact. So maybe a 3 or 4 layer board. I bet it would cost a bunch more but it might work if you really want that clean snap. Have you looked into v-socres on only one side of the board and traces on the other? I have seen prototype boards like this. It can be tricky getting all the traces into the right place, but vias make it easier. This is a great idea. I'd love to see a version where the components are broken out further, so that the individual components of the Pro Mini are on different boards. So have the ATMEGA on one, resonator on another, maybe a vreg on another, etc. That would be a great may to move people from the full Arduino package (even if it's a minimal one) to an understanding of how the individual Arduino components fit together (and how they can make their own choices about those components). Or, they could just look at a schematic. Nice product.. it 'll help grabbing knowledge in embedded programming quicker.. This is some really serious innovation! Great idea this one....! Great job! One of the most innovative products I've seen this year. Lol, you must have taken our building tour? re comment " the laziness of people is becoming sickening. Years ago, you would've had to solder your electrical components together to even make anything work." I do research and proof of concept designs , this Protosnap looks very cool! I have spent a lifetime sorting out [my] short circuits and this kit lets me get on with the creative side of my designs , I have just ordered one. A great design! i dont want to be mean or anything but did you have to slap the guy on the right side of his face to get him to do the video? So now you can prototype your prototype. I don't think that I could see my self using that, but for the beginner, maybe. Now where is my product post? I can't wait...arduino wars version 2.0....on the next Maury!!! Wow, great idea. The lilypad kits particularly would reduce the need for coasters and aligator clips to prototype before stitching! That's an awesome idea. I think I might have found a Christmas gift for someone. Wow, I'm really blown away by this, the beginner angle is one thing, but particularly for the LillyPad kits, this looks like a really convenient way to go straight from prototyping your system to installing it. How far do you go down the DIY Rabbit Hole?